Gillette Fusion ProShield Chill Men's Razor Blades shield while you shave. ProShield Lubrication before and after the blades lays down a protective layer to shield from irritation, with a Chill feature during the shave, thanks to Cooling Technology. Gillette Fusion ProShield is Gillette's most advanced razor. Just look for the blue blade and handle. Lubrication before & after the blades, shields from irritation while you shave. Men's razor blades with Cooling technology for a refreshing sensation during the shave. Gillette razor blades with 5 Anti-Friction blades; a shave you barely feel. Precision Trimmer on back, great for edging tough areas (nose and sideburns). MicroComb that helps guide stubble to the blades. 1 razor blade refill equals up to one month of shaves. Fits all Fusion5 and Fusion5 Power razors. 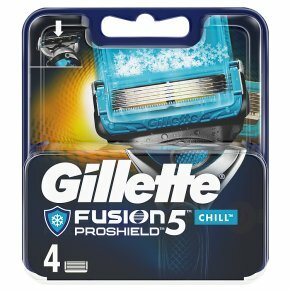 Gillette Fusion5 ProShield Chill men's razor blade refills feature 5 Anti-Friction blades for a shave you barely feel. With lubrication before & after the blades, it shields skin from irritation and cools while you shave. The Precision Trimmer on the back is great for hard-to-reach areas and styling facial hair. One razor blade refill equals up to one month of shaves. Fusion5 ProShield Chill mens razor fit all Fusion5 & Fusion5 Power razors. Gillette razors, formerly called Fusion ProShield Chill.